Join HPUMC’s longest-standing global outreach ministry as we care for the medically underserved people we have come to know and love in Haiti. We believe everyone deserves access to quality, affordable healthcare, but in Haiti, the majority of people rarely see a doctor or dentist. The earthquake in 2010 and hurricane in 2016 have only compounded problems as higher demand places even greater pressure on a medical system with few resources. Our work brings medical and dental care to thousands of Haitians each year! We send teams from the US and provide training and support to our Haitian partners, providing care and dignity in a place desperately in need of hope. Follow Rev. Rasmussen's journey during his 2019 trip! Join HPUMC’s longest global partnership by serving alongside medical professionals to provide basic medical and dental care to our neighbors in Haiti. Donated items can be left at the welcome desk outside Wesley Hall with a note that says, “Haiti”. 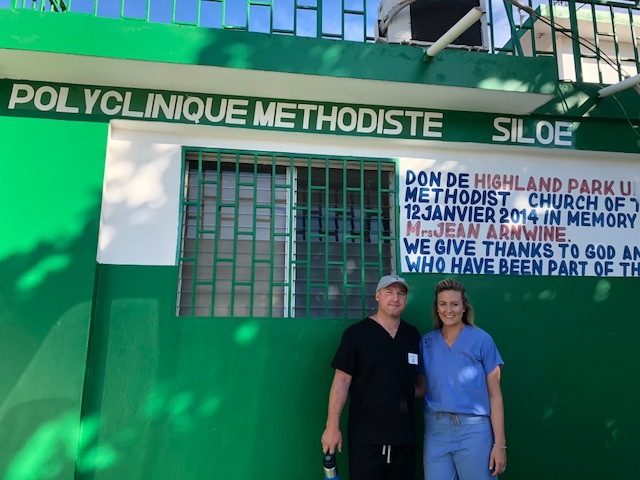 HPUMC supports the salaries of Haitian doctors, nurses and clinic staff in addition to helping supply and maintain equipment, providing materials for daily use and keeping needed pharmaceuticals in stock. Contributions of any amount are important to ensure ongoing operations, growth of services and continuation of the HPUMC legacy in Haiti! HPUMC's work in Haiti began in 1975 under the leadership of Rev. Leighton Farrell, Rev. Ken Dickson, and Dr. O.L. Willbanks. Since 1975, the HPUMC Haiti partnership has sent over 80 mission teams and now employs two Haitian Ophthalmologists, a Haitian general medicine doctor, several Haitian nurses, lab technicians and support staff who see patients year-round. An expansion of both facilities and services is underway to bring year-round dental and women’s health care to the people of Petit Goave. For more information contact Caroline Hazlett at or 214.523.2165.